Throw away your ironing board for good! 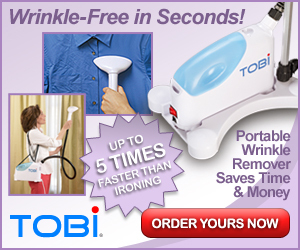 Tobi Steamer is the amazing portable wrinkle remover. It’s like having a dry cleaner right in your house. – To steam away wrinkles in seconds, just hang the garment on a regular hanger. No board or flat surface required. – The heat and moisture get rid of wrinkles in seconds. Turn the lighted switch to ON. – You apply no pressure. Just touch the garment lightly, and move the nozzle up and down. It’s easy – even fun! When your portable TOBI Wrinkle Remover arrives, you’ll be amazed at how simple and easy it is to get your clothes wrinkle-free – without ironing or trips to the dry cleaner. If you do not agree that TOBI is the best investment you’ve made in personal grooming and appearance this year….Or you are dissatisfied for any reason (or for no reason at all), just return the TOBI within 30 days for a full and prompt product refund. That way, you risk nothing.